“Summer, somewhere,” the first poem in Smith’s latest collection, “Don’t Call Us Dead,” is a carefully constructed afterlife free from — and built by — a history of racial violence. Smith, who uses the pronoun “they,” centers the book around mortality, a theme they feel intimately connected to, being young, black, queer and HIV-positive. An award-winning spoken word artist, Smith’s “Dear White America,” was a biting, cascade of a poem that tackles endemic violence, both physical and emotional, against black bodies. In his new collection, Smith wanted to imagine justice for the victims of “all the little and all the big violences.” He reanimates the bodies and souls of boys lost to “bonefleshed men in blue,” letting them wander in their new paradise, free of blood-drenched clothes, given second chances and new names. Monday marks the fifth anniversary of 17-year-old Trayvon Martin’s death. Smith says they can no longer argue the value of black lives to the large swathes of white America that can’t already see the importance of the struggle against racism and police violence. As long as there are laws and policies still in place that allow this violence to occur, Smith said, history will continue to repeat itself. And yet, the collection is hopeful, tackling the difficult subjects, but “always holding joy in the other hand,” Smith said. In another poem from the collection, “dinosaurs in the hood,” Smith’s version of imagined justice comes in the form of a rousing neighborhood of heroes: grannies shoot raptors from the porch and Academy Award-winning actress Viola Davis takes out predators with an afro pick. 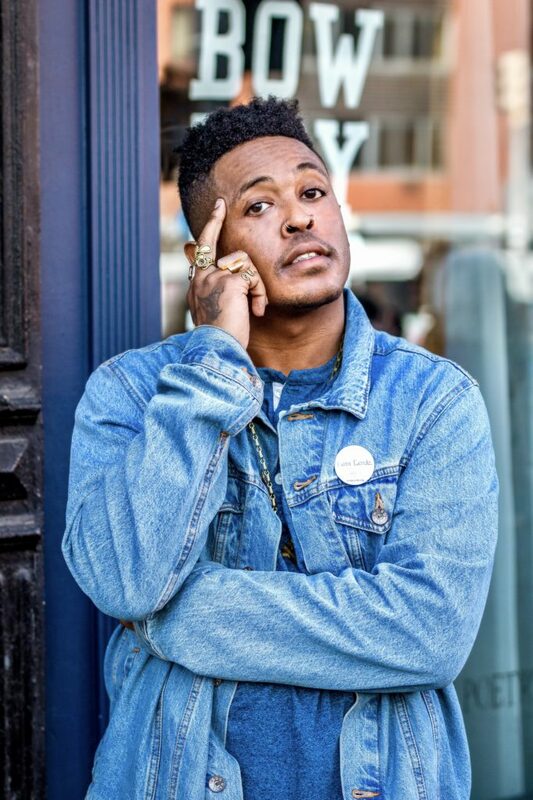 Danez Smith was born St. Paul, Minnesota. They are the author of Don’t Call Us Dead (2017), a finalist for the National Book Award; [insert] Boy (2014), winner of the Lambda Literary Award and the Kate Tufts Discovery Award; and the chapbook hands on ya knees (Penmanship Books, 2013). Smith is the recipient of fellowships from the McKnight Foundation, Cave Canem, Voices of Our Nation (VONA), and elsewhere. They are a founding member of the multigenre, multicultural Dark Noise Collective. Smith is a 2011 Individual World Poetry Slam finalist and the reigning two-time Rustbelt Individual Champion, and was on the 2014 championship team Sad Boy Supper Club. In 2014 they were the festival director for the Brave New Voices International Youth Poetry Slam, and were awarded a Ruth Lilly and Dorothy Sargent Rosenberg Poetry fellowship from the Poetry Foundation. Smith earned a BA from the University of Wisconsin-Madison, where they were a First Wave Urban Arts Scholar. They are a co-host of the Poetry Foundation’s podcast, VS.